A fun filled double coloring and activity book. 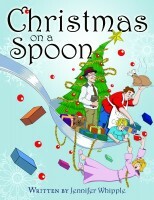 Come along side with Sara and her great adventure to uncover the big surprise Grandma has for her. Then flip it over and go on another adventure with Luke. Full of pages to color, mazes, connect the dots and more. Will provide hours of timely entertainment at home or while waiting their turn for a haircut at hair salon or barbershop. Bedtime used to be boring and routine for White Kitty and her best friend. Then one night, as they drifted off to sleep, a wild ride began. They flew through the air�up, up and away as superheros. They blasted off to Mars as astronauts. They took off as airplane pilots and train engineers. They won speed boat races and rode the highest roller coasters. The fun and adventures were waiting for them each night as they put on their PJs and climbed into bed. 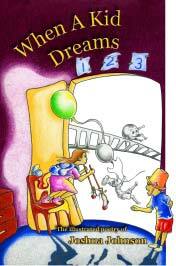 Join White Kitty and her best friend as they drift off to Adventures in Dreamland. Bedtime will never be the same again. It�s Steven�s 10th birthday! Last year, he had a big party, got lots of presents, and even met a professional basketball star! This year is different, though�Steven�s dad lost his job and left the family, his mom has to work all night, and he has to spend his birthday all alone. But Steven knows Jesus is always with him, no matter how sad and lonely he may be, and when his prayers are answered on this special day, he just might have the best birthday ever! 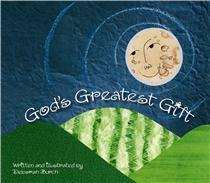 God's Greatest Gift is a lively, rhythmic and heartfelt story about a child discovering that he/she is a blessing from God. It demonstrates that every child living in our wonderous world is a unique and miraculous creation. Parents will enjoy sharing this special message time and time again with their greatest gift. 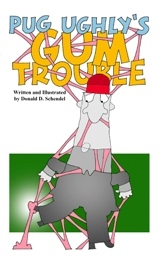 Little Shelby has been having a hard time at school making friends, and when she comes home one day and doesn�t even want her favorite sandwich, PB & J without the J, her Grammie knows something is wrong. Turning to prayer, God gives Grammie the perfect verse: Proverbs 18:24, �A man [who has] friends must himself be friendly, But there is a friend [who] sticks closer than a brother.� From this wise scripture, Shelby begins to learn not only what it means to be a friend, but also that even when she is lonely, she has a perfect friend in Jesus right by her side. Cheryl �Grammie� Jones spent more than 18 years teaching kindergarten and pre-school children. Her children�s stories come from her many years in the classroom where most were developed to teach and train children much as Jesus taught through parables. The birth of her grandchild was the catalyst for her first book; "Grammie in A Story of Friendship: PB & J without the J". Initially, she wanted to creatively leave a legacy of foundational faith for her grand-daughter and all of her future grand-children; now her modern day parables are on paper for everyone to enjoy. 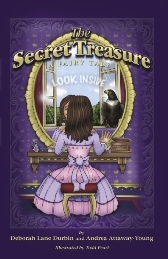 Come along with Jules, Toby, and Ruby as they journey into the forest to search for hidden treasure. They meet Nathan and his Kingdom Pal, David, who take them back to the time when David was a shepherd boy. David shares with them God's Treasure of Trust. 8.5 x 11 Large Limited Hardcover Edition. 72 Pages - Features an 8 page "Parents and Teachers Guide." 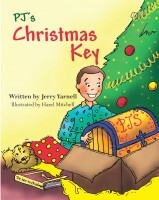 Beautifully Illustrated--A story that will touch the hearts of your children. It is the heart of every Christian pastor, parent, teacher and caregiver to share Salvation, the greatest gift of all with the children they love. But we often struggle with how to share this good news with our little one�s in an age appropriate manner, Humphrey and the Victorious Kids Series can help share this good news with our little one�s in an age appropriate manner. In Humphrey�s Shiny New Helmet! 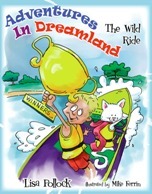 Book - 1 in the Victorious Kingdom Kids Series, author, Terri Evans, weaves a vivid, action packed adventure of faith and perseverance while sharing God�s love and salvation, along with addressing important character keys, such as making wise choices and accepting responsibility for our actions. The story also conveys the negative consequences of greed, the positive outcome of sharing and evangelism, as well as the benefits of obedience. In a story full of twist and turns Humphrey and his dad, Hopeville�s town watchman, eagerly set out on Humphrey's long awaited treasure hunt. Will Humphrey find his real treasure? As they reach their destination, a menacing shadow lurking in the distance catches the eye of Humphrey�s eye. His dad immediately sets out after the shadowy figure in fierce pursuit. Humphrey disobeys his father command and runs after him. When they reach the edge of a cliff, Humphrey falls head over heels into the evil, disgusting pit of Greedland! His father�s one and only hope is to have faith and pray that God will deliver Humphrey. While Humphrey�s father is at the edge of the cliff praying fervently, Humphrey is in the horrid pit of Greedland, faced with making crucial choices that will either lead him closer to his shiny new helmet and a way out or further away and deeper into the pit of Greedland. The Victorious Kingdom Kids Series was inspired by Ephesians 6:10-18 and Terri�s zeal for children to receive Jesus Christ as their Savior and walk in the fullness of their Salvation. Humphrey�s Shiny New Helmet! addresses questions about salvation concluding with a personal invitation from Humphrey to his new friends to accept Jesus as their Lord and Savior. 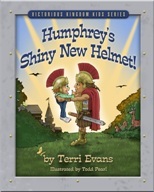 Download free, bonus online resources at http://www.shalomkidsint.com: Humphrey�s Shiny New Helmet! Ministry Moments Devotional and Reading guide, Humphrey�s E�xcite (Expand, Elevate & Empower) Lesson Plans, Salvation Treasures Devotions and a Scriptural Index. A must have for any Parent, Teacher, Children�s Pastor or Caregiver introducing Salvation to 4-10 yrs olds! Kitty Kate's Tea Party is the first in the Kitty Kate's Celebrate Life Series. In Kitty Kate's Tea Party, Kitty Kate is invited to tea with Aleah Jane. They discover even though sometimes things just don't go as planned, every day is still worth celebrating! Karen Dean is a gifted artist and storyteller who makes her home in southeast Michigan. She has a B.A. in Interior Design and Fine Arts and an M.A. in Clothing and Textile Design from Eastern Michigan University. Having studied under Master Artists in oil (Flemish Realism) and watercolors, she does portraits and other fine art from her home studio. Ever since her two daughters married and made her a 5-time grandmother, Karen has had a God-given vision to create a series of children�s travel books. She wants parents, grandparents and children to delight in the journey to some of the most interesting travel destinations via her colorful and lively books. In addition to the travel books, she is creating fascinating new characters to delight her audiences at school visits and other speaking engagements. She takes them on a journey through the writing and illustrating process, including an attention-getting painting demonstration. Kitty Kate came for tea today. We partied in the parlor. Lazy Squirrel is a lazy and inconsiderate little squirrel. He plays all day; he eats when he is hungry, drinks when he is thirsty and sleeps when he is tired. He has no self-discipline at all. He hates work and tricks others to do his work for him. One day he meets hardworking, kind and considerate Busy Squirrel who risks his own life to save the life of his new friend, Lazy Squirrel. After running out of food during a hard cold winter, an encounter with a night creature and a fitful sleep with a special dream, Lazy Squirrel is given a new lease on life and has a change of heart. He now understands the value of working hard and real friendship and is determined to share what he has learned with others. Children of all ages will love this engaging tale and brilliant illustrations of the lives and adventures of two furry little squirrels. Parents will love the positive messages of being responsible, helping others, doing your best, working hard and real friendship. 36 Pages, 8.5 x 11 Softcover Edition. Luke�s 1st Haircut, by Catherine Marek, a mom and hairstylist herself, may be just what you need to take the fear out of what can be a traumatizing experience for some children. 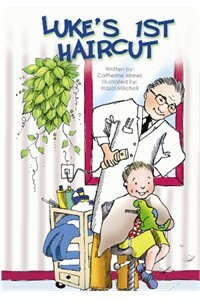 This brilliantly illustrated rhyming tale of Luke�s adventure to �The Barber Shop Place� with his grandfather is perfect for any young man preparing for that special right of passage, �going to the barber to get his first real hair cut�. Whether your child is a little leery or excited about the prospect of going to the barber this book will fast become a family favorite. The story will take your little one right along with Luke as he experiences the sights, sounds and smells of a real barber shop. Luke starts off a little afraid of all the things that are going on but he triumphs in the end with handsome hair and a smile that will let your child know that going to the barber shop can be fun and is nothing to fear. Creatively written and easy to understand�for our little ones. 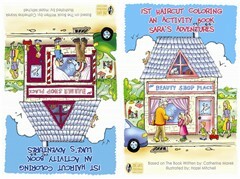 The illustrations being bright and positive will help prepare a toddler for their 1st hair salon experience. A must for any young family to read. "Having been in business nearly 37 years, I've seen and heard many a child's first hair cut. In many cases, it was a trauma for the child. The stylists and mothers telling the children "it won't hurt," only made it worse. So I feel this book would be a great asset to grandmothers, mothers and not to mention "The Beauty Shop." IT�S THAT TIME OF YEAR AGAIN�time for Happy Valley�s Field Day activities. PJ Stanley is excited about his school�s annual day of fun, games, and especially the races, which he won the year before. This year the competition is super tough and PJ is worried about winning. His classmate, Stacey, is really fast and is on his heels, as they get to the finish line, PJ�s pride kicks in and he takes �steps� that assure his victory. He wins the race, but in his heart he doesn�t feel like a winner. PJ begins to understand that HOW we win, is more important than just winning for pride�s sake and a 1st Place Ribbon. Pastor Jerry Yarnell reminds us all to always hold dear the love of our Heavenly Father and appreciate the wonderful gift He sent to earth on that first Christmas. Sara�s 1st Haircut, by Catherine Marek, a mom and hairstylist herself, may be just what you need to take the fear out of what can be a traumatizing experience for some children. 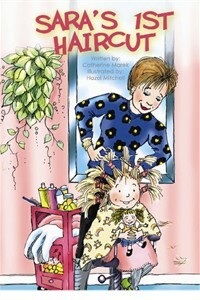 Whether your child is a little leery or excited about the prospect of going to the salon, this book will fast become a family favorite. The story takes your little one right along with Sara as she experiences the sights, sounds and smells of a real beauty salon. Sara starts off a little afraid of all the things that are going on, but she triumphs in the end with beautiful hair and a smile that will let your child know that going to the salon can be fun, and it is nothing to fear. "Having been in business nearly 37 years, I've seen and heard many a child's first haircut. In many cases, it was a trauma for the child. The stylists and mothers telling the children �It won't hurt� only made it worse. This book will be a great asset to grandmothers, mothers and not to mention �The Beauty Shop Place.�"
Also available is Luke�s 1st Haircut and 1st Haircut Coloring and Activity Book. Celebrate the beauty of summer as you relive memories of running though sprinklers and chasing after ice cream trucks. A perfect summer day comes to life with playful, rhyming text and colorful illustrations in The Wonder of a Summer Day. The pages are filled with heart-warming words that will make you feel happy and take you back to the simple pleasures in life. Share the joys with someone you love. Laura Becker lives in White Lake, Michigan with her supportive husband and daughter where they together live in the wonder of each summer day. Johnny Baxter hates going to school. For years, all the kids at school have teased him about his freckles and he has a bad feeling the third grade isn�t going to be any better. But to Johnny's surprise, one unusual day everything suddenly changes. Connie, a fellow classmate, tells Johnny that God cares about his feelings. And so Johnny discovers through prayer and a miracle, that God really does care about him. 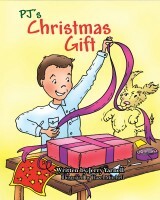 Join Johnny, his classmates and freckles as they discover that God�s way of doing things is always the best way. This anti-bullying message is great for all ages to help children gain godly compassion and understanding for others no matter how different they may appear on the outside. Inspired by this favorite quote from his youth, Joshua Johnson�s beautifully illustrated collection of poetry is an exciting journey into the dreams and aspirations of children... Told and illustrated from a child�s eye view, young readers can feed their imaginations and expand their horizons � this collection makes it clear that no dream is impossible! Johnson�s whimsical poetry and artwork is ideal for children and parents looking for adventure AND growth, with characters and stories both relatable and fantastic. So come in and join The Girl Who Flew, Ivan the Inventor, and a cast of many other colorful characters as they explore what it is to dream � and how far those dreams can take you! Where Do Crickets Go When Winter Comes? Did you ever wonder how Mother Nature takes care of bugs, frogs, worms and fireflies when we no longer see them during the winter months? Do they hibernate, die off or migrate during that time of year? And what about caged birds who would normally head south for the winter? Phyllis Russell-Gilmer provides the answers to these questions and more, in her exciting new book, "Where Do Crickets Go When Winter Comes?" You'll meet Casey Cricket, Wanda Wasp, Fergie Frog and others to learn about their winter activity or lack of. Phyllis' new book will provide your children with a unique exposure to science while entertaining them as well! Pug Ughly gets into a tangled mess when he steps in a discarded wad of gum, as we all sometimes do. After attracting more critters than the local zoo, he gets out of this mess with the help of some smart kids and their mother�s goo. Katie was such a happy, playful baby with a big smile and sweet giggles. After her first birthday something changed about Katie. Her big smile turned upside down and her sweet giggles became a loud scream. So loud, her family had to wear ear muffs just to cope. Join Katie and her family as they go on a search to find Katie�s smile, teach her how to get along with friends and control the scream or at least bring down the volume a little. Every child is unique and deserves love. 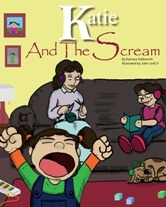 This series was created to assist in dealing with the emotional distress of children. The stories suggest solutions to behavior that may be inappropriate caused by the lack of ability to properly express feelings. They bring laughter and ease tension to situations that may cause a child to be misunderstood. These stories are fun and easy to read. They demonstrate values like obedience, perseverance, patience and self-esteem through the nurturing of parents, teachers and caregivers. Summary: A book series to help emotionally impaired children and those who care for them deal with the everyday challenges of life. Emilee and her family are moving to a new city. She just didn�t want to believe it, but now it was really happening and she was not happy about it�at all. Emilee could only think about the friends she was leaving behind. Emilee�s father tells her about their new home, the new friends she will make and new memories they will create together as a family, this cheers her up�a little. The next day they pull up to their beautiful new house, Emilee thinks to herself, �This might not be so bad after all.� But as she unpacks she finds out that her best-friend Fizz, has gone missing. Emilee is faced with a big choice that could possibly help Fizz find his way back home or could backfire, and cause both of them to be lost. She wishes to become a butterfly in order to save her best friend, but will her wish come true? Come along with Emilee on a heroic journey to find Fizz, who ends up in Butterfly City�the home of, Fats, the meanest caterpillar you�ll never want to meet and his loyal followers�the Butterfly Society. She meets new friends and gains the trust of the Forest Watcher�s Alliance as they unite on a quest to rescue her best friend, Fizz, from Fats and the Butterfly Society. 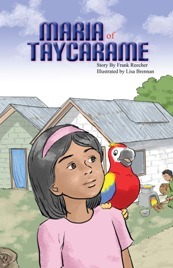 Ten-year-old Maria lives a life in the poverty stricken third world country of Taycarame that most fifth-graders could never imagine, watching as many of her friends are forced to go to work to help support their families. She is blessed however, with a loving family, and with her loyal parrot friend Paco always at her side, Maria makes the most of her difficult situation. Miraculously, Maria is introduced to Sparrow Organization For Children, a sponsorship program from the U.S. that provides sponsors the opportunity to share money, love, and the Word of God to impoverished people around the world�and Maria learns that the love of Jesus Christ and the generosity of one compassionate soul can change her world forever. A Day in the Life of Amanda explores the joy and positives emotions of A Good Day in the life of Amanda. You then flip it over to explore the sadness and negative emotions of A Really Bad Day in the Life of Amanda. Helps childrens and parents understand the impact of thier words on the life and emotional state of our little one. Great discussion tool for being a good friend, bullying and more. Judy Seaberry is an author who strives to write about relevant issues. As a native Detroiter she has experienced multiple challenges and changes that shaped her own life as well as the life of her city. Judy s love of reading and writing came full circle when in 2004 she retired from corporate America and wrote her first book Is your family dysfunctional? On the heels of her first success she tackled romantic relationships by writing Men from A to Z.
Judy is a rare author who uses humor seamlessly in her writing to ease into difficult subjects. Both of her previous books go to the core of what issues we face when we connect with others. A Day In the Life Of Amanda goes one step further. Amanda allows us to experience the young soul, as family, friends and society shape her life. Through Amanda s eyes we witness our own behaviors and how they effect her attitude. Through Amanda s prayers we witness the impact our actions have on her spirit. Sir Haunz & Gertrude�s Great Escape is about two children, whose father lost his job due to downsizing in his automotive industry in Toledo. Their parents made the hardest decision of their lives; to send their children away to live with relatives while they worked at getting back on their feet. However, tragedy strikes. The children are left homeless and alone in Chicago and have to learn to fend for themselves. In today�s climate of economic uncertainty the story is literally, art imitating real life. But the story doesn�t end there. Haunz discovers he has a special gift�a talent. He uses that gift to overcome obstacles and eventually culminates in their great escape from hopelessness, poverty and a life of uncertainty. Joyce Lewis is a Special Education Teacher in the Toledo, Ohio School District. Her passion to see them succeed inspired her write Sir Haunz & Gertrude�s Great Escape. 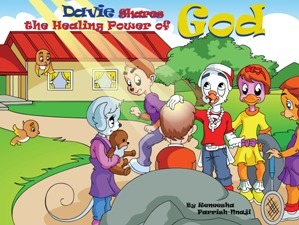 Join Davie Divinity Dove as he shares the healing power of God with his friends. �But He was wounded for our transgressions, [He was] bruised for our iniquities; The chastisement for our peace was upon Him, And by His stripes we are healed"
Is a graduate of the Word of Faith International Christian Bible Training Center. I grew up in a Christian home and was continuously surrounded by the Word of God from a young age and I believe that is why I am, who I am today. I also feel, as Christians we are responsible for sharing the �faith� with the next generation and to assure that they are taught the word of God�the younger the better. God�s word will change lives when it is taught, read and understood. When I was accepted as a student at the Bible Training Center, I understood why I was there; and that was to learn more about God and to learn how to effectively communicate His word to people at their level. I am passionate about children learning the right things (God�s Word and Way of doing things) so they can grow up to be productive adults with a reverence for God. The Davie Shares The Power Series is God�s word at an age appropriate level for young believers. It was inspired by God to transform and counteract the media that could negatively influence the behavior of our Christian children. My ultimate prayer is that the first book in this series, Davie Shares the Healing Power of God, helps to take the focus off the evil, sickness, disease and lack in the world and give children hope and help build their faith to believe what God says in His Word, about who they are, and what the Word promises us. This is a story about Joseph�s donkey. His name is Hosanna and he is devoted to Joseph, but he is bored with his mundane life and longs to do something important. He is jealous of the big, beautiful horses he sees who seem so grand and important, but his outlook begins to change as he journeys to Bethlehem with Mary and Joseph and witnesses the birth of the Savior. Holli Worthington lives in Southern California with her husband of 28 years. They have recently begun the �empty nest� phase of life. They have a son and two daughters, a daughter-inlaw and a son-in-law. One of her greatest joys has been the adventure of raising her children. She has worked with children over the years in many capacities, teaching Sunday school, leading children�s choir, teaching preschool, first grade and special classes for gifted children. She loves books, art, reading and stories, so writing a story for children that points them to the gospel combines the passions of her heart. Judy Enright resides in Southern California with her husband of 50 years. She has two daughters and 6 grandchildren. From a young age she was captivated with drawing, and spent her early years trying out various art mediums. She painted in oils as well as acrylics as a self-taught artist. For over a decade she also designed and made wedding gowns and then discovered the art of porcelain painting and became a serious student. She found a wonderful teacher and friend who challenged and stretched her as well as taught her eye to truly �see� everything, for which Judy is eternally grateful. She is thrilled that God is using her painting for His glory. Alive in Him is a devotional written for kids (from about 10 to 14) by a kid (Caroline Stoerker) and her grandmother (Ellie Krause, aka Nana) who know firsthand the challenges and rewards of living a Christian life in today�s world. Caroline and her Nana wrote the book to inspire kids to live out their faith in their everyday lives. Alive in Him has 26 weeks of light-hearted short story devotionals addressing problems, challenges and situations kids face every day. 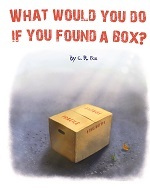 Following the short story is Words to Live By (Bible Scriptures) and daily thought provoking questions that help kids to apply the principles written about in the short stories to their lives. The weekly devotional ends with a call to action in LIVE IT; which challenges them to show the world they are ALIVE IN HIM. What happens when the bully becomes the victim! Bossing everyone else around became a bad habit for the main character in Big Shot. Other students were afraid of him because of his mean actions, words, and stares. He didn�t care who he hurt or made cry, both girls and boys. He wanted to be in control as much as possible. It was going exactly as he wanted until one day, it all changed. He moved away and had to go to a new school. Then he worried about what he was going to have to go through. How would he be treated by the bullies at that school? After confessing his bullying to his Dad and counselor, he was told to apologize to the classmates at his old school. Even though it was hard, the apology helped the other students and helped him to understand the hurtful effect he had on others. The discussion questions are a useful tool to help students verbalize how it feels to be annoyed or tormented by a bully�s actions and words. Seeing how quickly a bully can become a victim will help students be more aware of their ways. 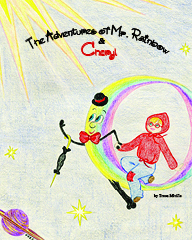 Join Cheryl as she goes to visit her good friend, Mr. Rainbow who takes her on a grand adventure where she meets the Father and the Good Shepherd. There she experiences peace, joy and beauty far beyond the limitations of this world. When Cheryl returns home from her adventure she wants to share the good news of her great adventure with everyone. Angel is four years old. He loves daycare, but he is a little different from the other preschool children that go there. He is a mouse, and he lives with his mom and dad in a special little place in the corner of the daycare. He attends daycare whenever the children are there. His mom and dad warn him to make sure he is not seen and not to go to far. It�s when he ventures out further into the daycare than he has every gone before and forgets the instructions of his parents, that his adventure begins. 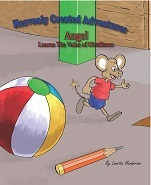 Come along with Angel Mouse as he goes on a heavenly created adventure and learns the value of obedience. 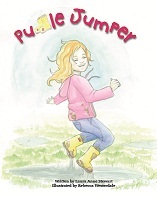 Join us, as my little puddle jumper celebrates her special day, and delights in the BIG SURPRISES that come from jumping in tiny puddles, huge puddles and puddles of all different sizes. It rains all night, and then the morning comes; It�s her birthday and time to have fun! Little Bee is the youngest and smallest bee in her hive (her brother even had the nerve to call her a �runt�). She lives with her family in the beehive colony near Cloverleaf Field. Little Bee wants to bee the best at something. Her brother boasts that he is stronger and her sister constantly brags about beeing faster, not to mention older, smarter and prettier. Little Bee wonders how she can prove that just because she may be the �runt� of the family, she can still bee the best at something. While Little Bee is out collecting pollen with her brother and sister, her best friend, Izzy, flies up and tells her about the Great Honey Contest. Little Bee announces that she is going to enter the contest. Join Little Bee, Izzy and her family as they discover that beeing the best doesn�t always mean beeing the biggest, strongest, fastest, prettiest or even the smartest. Caroline Stoerker was thirteen years old when Little Bee and the Great Honey Contest was first accepted by her publisher, but only ten when the story was originally written for a school project. 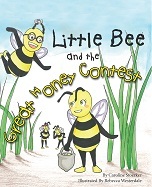 Little Bee and the Great Honey Contest is the first of The Little Bee Series and is the second book Caroline has published. 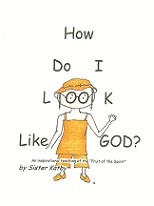 The first book she published when she was twelve and was a devotional for tweens, Alive in Him. When she has free time, Caroline enjoys reading, writing, listening to music, playing piano, and spending time with her friends and family. Mr. James Hart believes in living in the spirit of Christmas year around. He volunteers and gives to others every chance he gets. He appears at an agency during the Christmas season and volunteers to help. 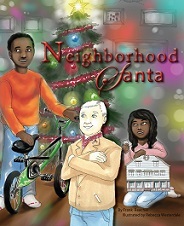 And help he does� In the Neighborhood Santa, a young struggling family is drawn into an amazing adventure they will never forget and Miss Needles, a mean caseworker, gets a needed lesson in compassion. This story is a modern day Christmas Carol with a twist.